This past week has hosted a variety of extreme and unprecedented weather events. In the US, storms pummeled a region from the Dakotas to the US East Coast while Colorado suffered its worst wildfire ever recorded, the third time such a dubious record has been broken in the past year. And, in the Arctic, a persistent cyclone (PAC 2013) ended its 3rd week of ice thinning as Greenland melt blew through the usual summer maximum with hardly a pause. A storm system that spawned numerous severe thunderstorms, high wind events, hail, heavy rain, and sporadic tornadoes swept through a broad swath of the northern, central, and eastern United States from Tuesday through Thursday. 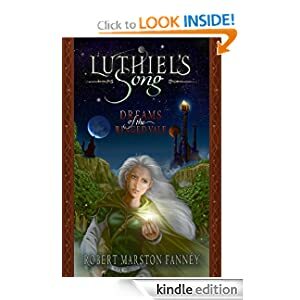 Major power outages were reported over this broad region and, sadly, one death occurred when a little boy lost his life to falling trees in Virginia on Thursday. NOAA’s Storm Prediction Center (SPC) logged 376 reports of damaging thunderstorm wind gusts in the 15 hours ending at 11:25 pm EDT Thursday night, and three of these gusts were 74 mph or greater. 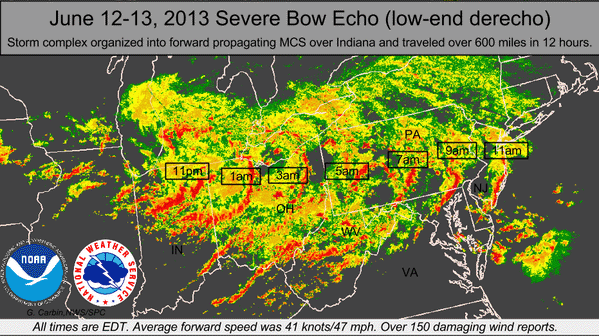 SPC is now acknowledging that Wednesday’s bow echo that traveled 600 miles from Indiana to New Jersey was a low-end derecho, with over 150 damaging wind reports. The most impressive thunderstorm winds from the derecho occurred in Wabash County, Indiana, where a “macroburst” produced winds of 90 – 100 mph across an area seven miles long and three miles wide, destroying three buildings and causing extensive tree damage. Total damage from the two-day severe weather outbreak over the Midwest and Mid-Atlantic will likely run into the hundreds of millions of dollars. Meanwhile, the western drought, still covering over 44% of the US, spawned the most damaging fire in Colorado history. Again. The Black Forest Fire has now destroyed nearly 400 homes, killed 2 people, forced nearly 40,000 people to evacuate, and burned over 18,000 acres. Last year, the High Parks Fire and then the Waldo Canyon Fire each successively broke the record, set in 2002 for the most damaging fire in Colorado history. Now, just one year later, the Black Forest Fire has again taken the record. Three record damaging fires in one year is anything but normal. But, according to climate forecasts, things are going to get much worse for Coloradans. According to this US Department of Agriculture study, under a ‘moderate global warming scenario’ in which Colorado temperatures rise by an additional 1 degree Celsius by 2050, the area burned by forest fires would increase by 2.8 to 6.6 times the current level. Fuel for the Colorado fires is provided by an embedded drought which has persisted in the region since last spring. Unfortunately, a switch to mild La Nina conditions in the Pacific may indicate that the US drought is set to expand once more. 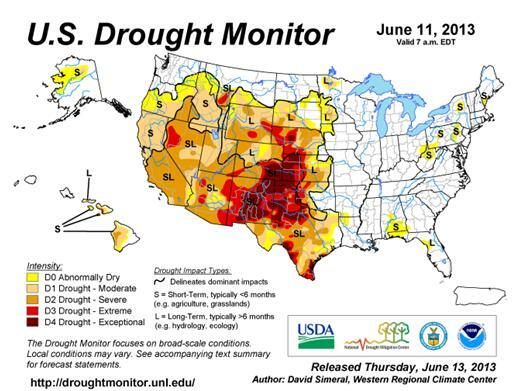 Droughts are also predicted to grow more severe for the southwestern and central US as global temperatures rise. And this projected increase in drought conditions not only has implications for increasing risk of fire, it also drastically impacts US food productivity. Farmers already suffering from last year’s drought can still expect to face climate extremes over a large area of the US. And with La Nina increasing risks that drought will re-expand, it appears the beginning of a long era of damage to crops and increased risk of severe fire via the ratcheting effects of climate change is now starting to settle over the US. 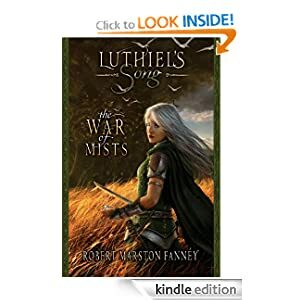 Moving northward into colder climes we enter the epicenter of another ongoing tale of climate change tragedy. In this case, a Persistent Arctic Cyclone which has continued to batter and thin the northern polar sea ice has now entered its fourth week. 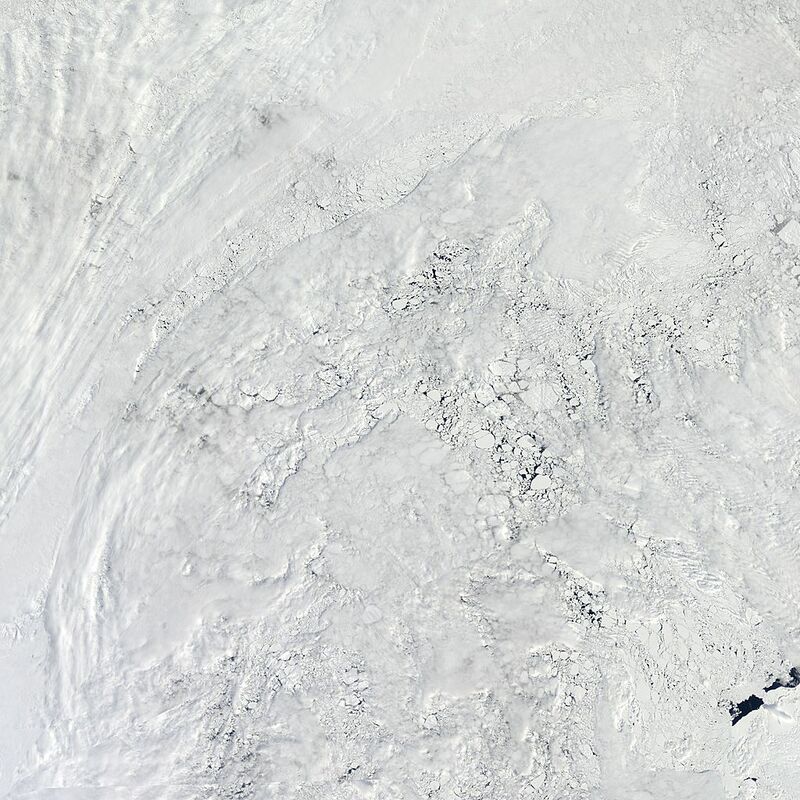 The storm continues to pull warmer air into the Central Arctic from the south. Now, much of the Arctic Basin is experiencing above freezing temperatures. Yesterday, Barrow Alaska, one of the coldest cities in the Northern Hemisphere, experienced a 65 degree high, about 26 degrees above average for this time of year. The below weather map shows temperatures above the freezing point of sea water (-1.9 C) covering all but a few isolated locations. In one location on the coast of Siberia and bordering the Arctic Ocean, the temperature has risen to a balmy 27 degrees Celsius or about 81 degrees Fahrenheit. 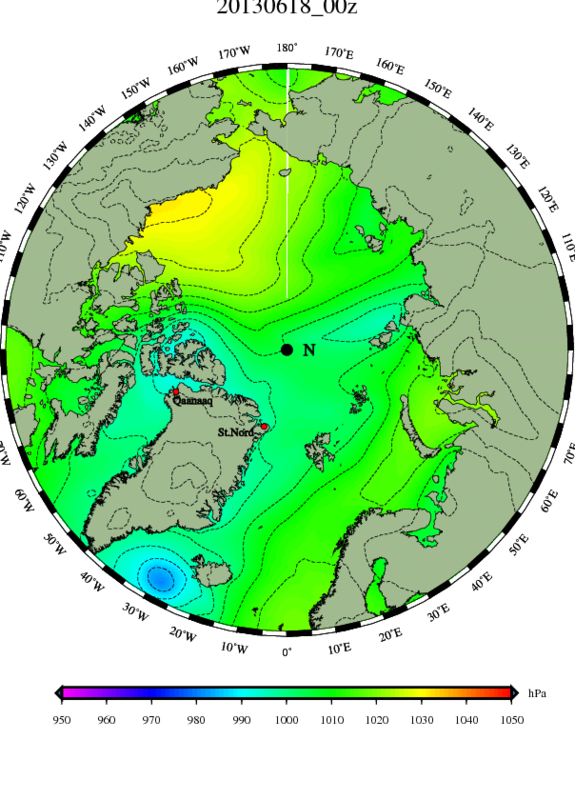 Forecasts for the storm have tended to trend for it remaining in the Central Arctic at least until late next week. If these forecasts bear out, by next Friday we’ll begin talking about the month-long storm. 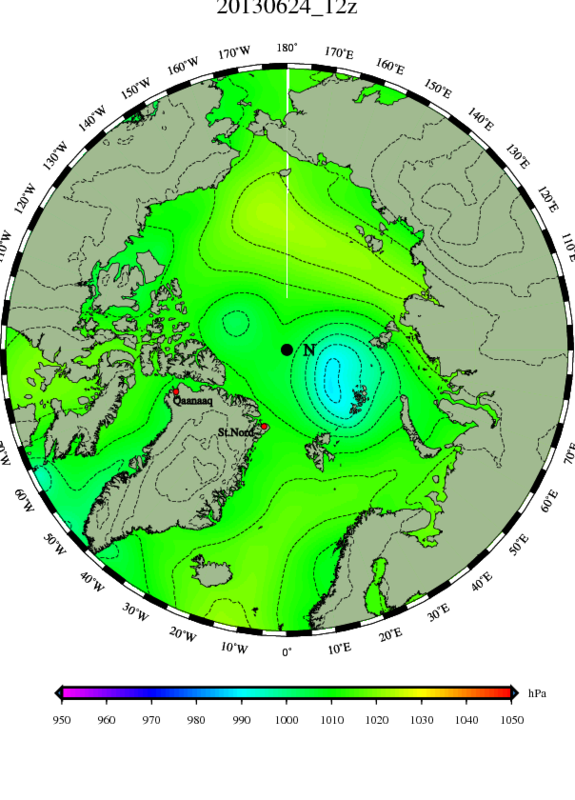 With the storm continuing for so long, it is forecast to really begin digging deep into the Arctic sea ice by next week. 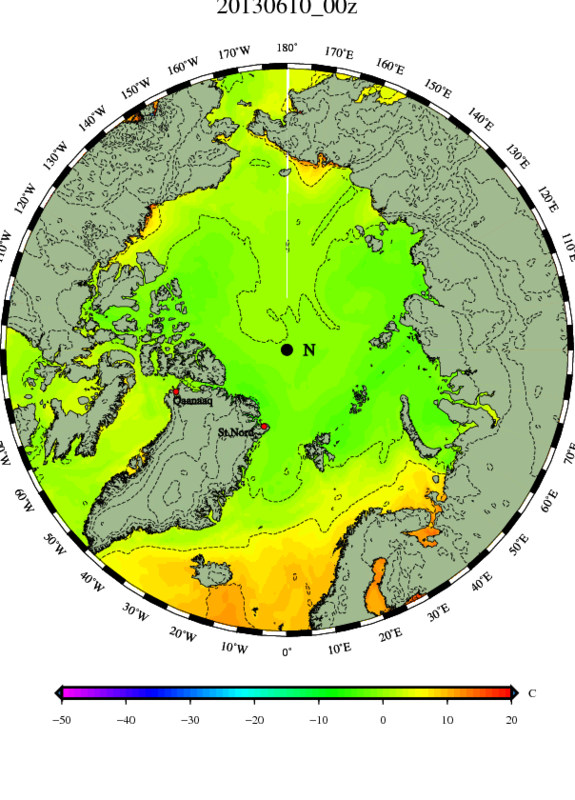 US Navy models continue to show major thinning in a broad swath from the Laptev Sea to the North Pole and creeping on toward Svalbard. Such projections show continued, dramatic and rapid thinning ramping up all the way through June 21rst. At this point, PAC 2013 begins to look more like the nightmare scenario I discussed in The Warm Storm blog and less like the strong thinning event we’ve witnessed thus far. It is worth stating that we’ve never before witnessed a Persistent Arctic Cyclone thin the ice to any note-worthy extent during June. This particular storm is already unprecedented in its impacts and the fact that it continues and is projected to continue for at least the next ten days should be major cause for concern. 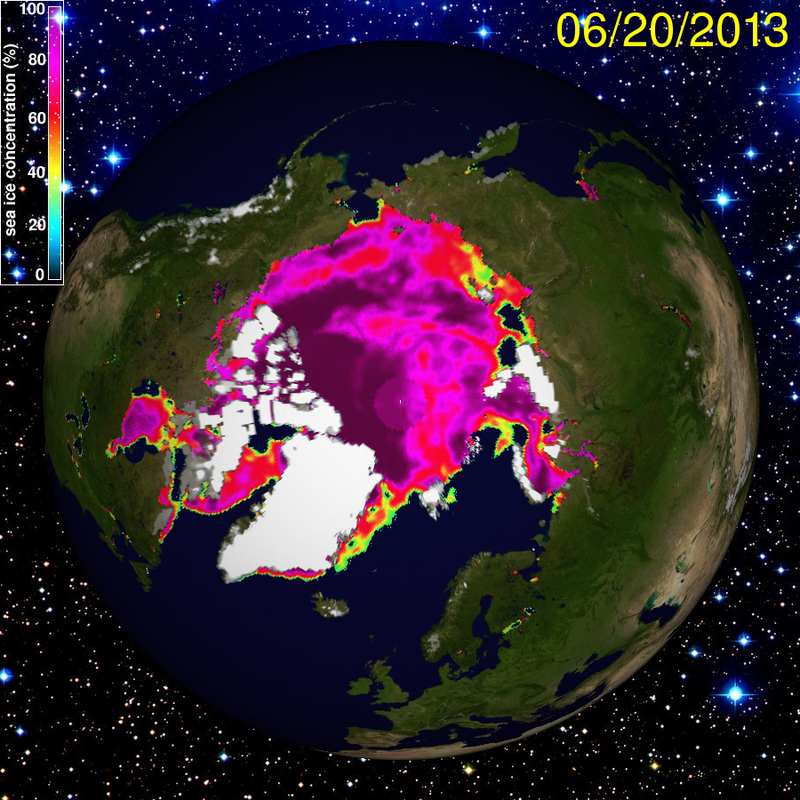 Simply put, the Arctic sea ice is in ongoing and deepening peril. 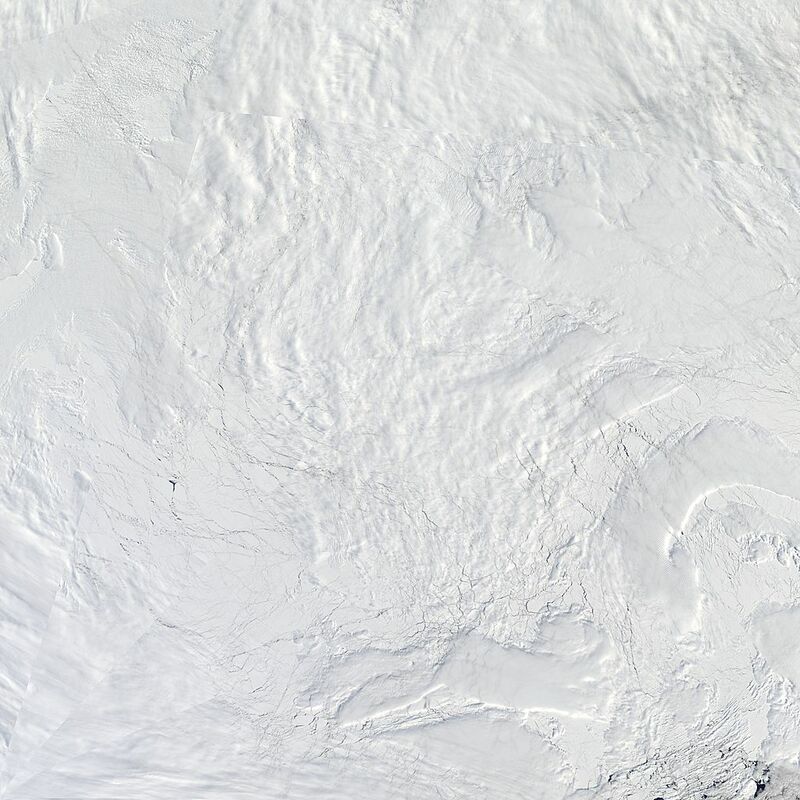 Should these amazing thinning and melt values the Navy is predicting emerge next week, we’ll have to modify our ‘Ice Free Arctic’ prediction (currently at 10% for 2013) accordingly. Meanwhile, a related warming and melt is now occurring in Greenland, may be set to challenge an extreme record 120 year melt seen just last year. 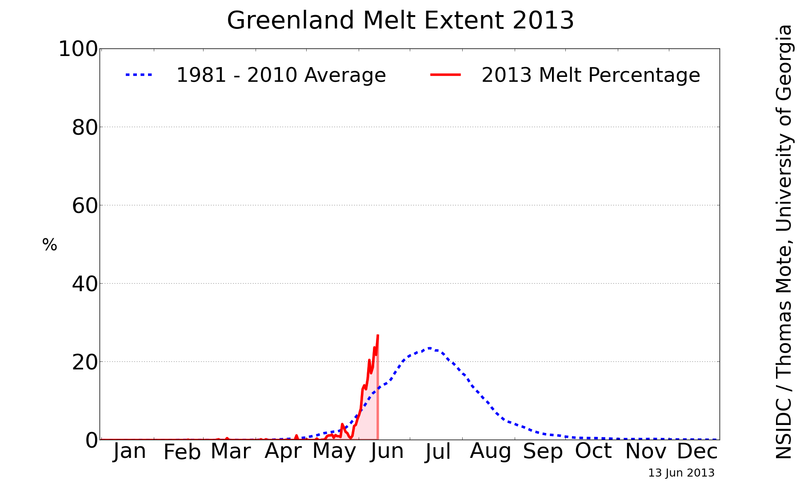 Earlier this week, Greenland melt surpassed maximum summer melt values usually seen in mid-to-late July. Today, these melt totals proceeded to spike without hardly a pause. Current melt coverage is still below last year’s record of near 100%. However, those values didn’t emerge until July and current melt is proceeding at a rapid enough pace to raise concerns that the 2012 record could be challenged this year. 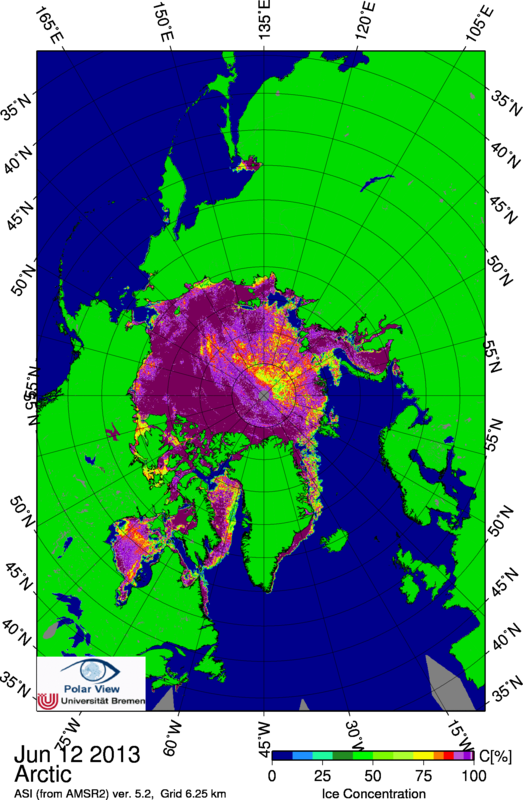 Greenland melt is a major driver of extreme weather events. 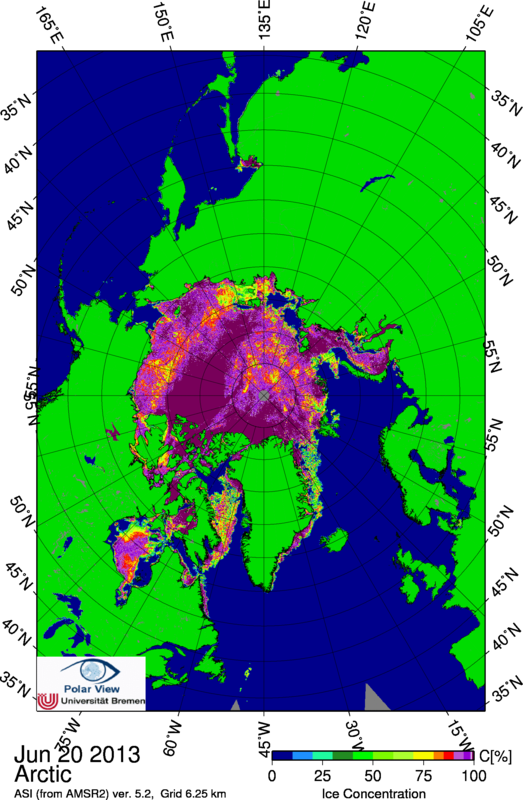 Melt has currently reached an average of 500 gigatons from the Greenland ice sheet annually. This level is already three times that observed in the 1990s. 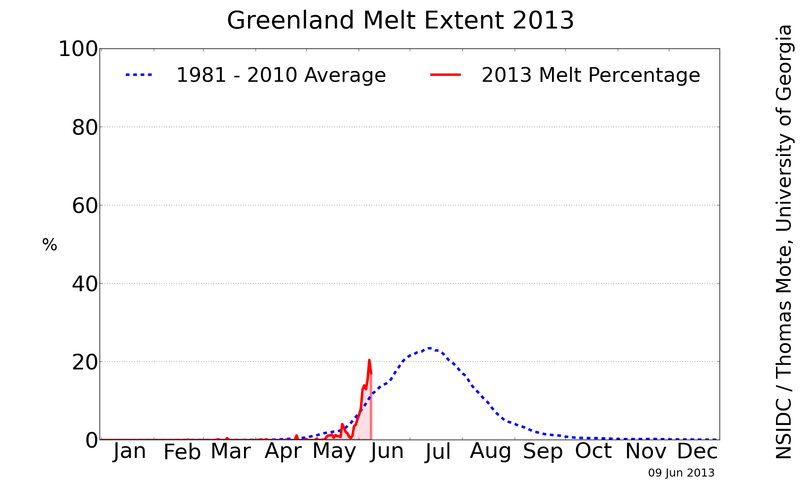 But melt rates are still rising over time. This massive and growing volume of melt water has already slowed the Gulf Stream and is likely playing a role in severe winters and springs in Europe. Combined with sea ice erosion, which Dr. Jennifer Francis has implicated in a slowing of the Northern Hemisphere Jet Stream, Greenland melt is a powerful driver of the extreme weather we expect to see as climate continues to change. Of these four events, three — the Colorado fires, PAC 2013, and amplified Greenland melt — can be directly attributed to a warming climate. The derecho, on the other hand, was likely made worse by a combination of alterations to the global jet stream, increased atmospheric heating, and increased water vapor pumping up the thunderstorms it spawned. Together they provide a context of climate change. One we are just starting to see emerge and one that will likely grow far worse should we not rapidly reduce our use of fossil fuels.